The ONRAX Enduro-Deck™ system ONRAX, the industry leader of industrial strength ceiling storage platforms and ceiling storage innovation, has developed the Enduro-Deck™ decking system. 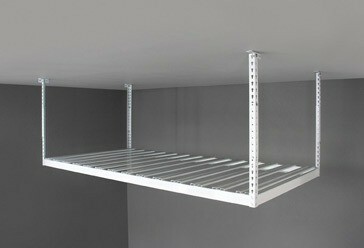 The patented design of Enduro-Deck™ is a visually stunning, streamlined advancement in shelving technology. The exceptional strength of the ONRAX 14 gauge steel C-channel box frame, partnered with the Enduro-Deck™ system, allows ONRAX units the highest weight rating of any ceiling mounted storage unit on the market, up to 800lbs.